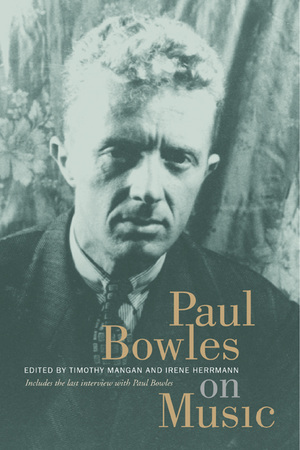 "It's an easy enough job if one has something to say," Paul Bowles remarked in a letter to his mother about his first foray into music criticism. And Paul Bowles, indeed, had plenty to say about music. Though known chiefly as a writer of novels and stories, Paul Bowles (1910-99) thought of himself first and foremost as a composer. Drawing together the work he did at the intersection of his two passions and professions, writing and music, this volume collects the music criticism Bowles published between 1935 and 1946 as well as an interview conducted by Irene Herrmann shortly before his death. An intimate of Aaron Copland and protégé of Virgil Thomson, Bowles was a musical sophisticate acquainted with an enormous range of music. His criticism collected here brilliantly illuminates not only the whole range of modernist composition but also film music, jazz, Mexican and Moroccan music, and many other genres. As a reviewer he reports on established artists and young hopefuls, symphonic concerts indoors and out, and important premieres of works by Copland, Thomson, Cage, Shostakovich, and Stravinsky, among others. Written with the austere grace of his better-known literary works, Bowles's criticism enhances our picture of an important era in American music history as well as our sense of his accomplishments and extraordinary contribution to twentieth-century culture. Winner of the ASCAP Deems-Taylor Award for music criticism, Timothy Mangan is classical music critic for the Orange County Register. Irene Herrmann is Lecturer in Music at the University of California, Santa Cruz, and the executrix of the Paul Bowles music estate.